Dejected—and with teeth gritted—you return to your desk to do it her way. You wind up stewing the rest of the day. Disengagement has already begun and you’ve only been with the company a few days. You had so much hope coming into this new job. Where did things go wrong? …and into the right seats. This common phrase (coined by Jim Collins) has become a tired cliche largely because most managers simply don’t know how to do it. Getting the right people on the bus is not a function of HR, it’s a function of leadership. And it starts with Corporate Self-awareness. If you know who you are and things the company would live and die for, then you can embed recruitment processes and reward systems that attract and retain people who will do everything in their power to make you (and them) successful. Define the seats with care. When establishing roles, also describe the blend of talents, beliefs, and behaviors that will make a person successful when performing each job. For example, empathetic customer support staff relate well to customers calling in with problems. Add a strong analytical ability and feeling of responsibility and this person will doggedly pursue problem resolution and wow customers every time. Don’t leave chemistry to the scientists. Will styles mesh well? People leave their jobs because of the boss, not because of the company. Do personal values line up with company values? No? Do not extend an offer. It doesn’t matter how much talent the candidate has, this person will quickly poison your culture. Do candidates need all of the skills you think they need on day one? No. Daniel Pink, author of Drive: The Surprising Truth About What Motivates Us tells us that people want autonomy, mastery, and purpose in their jobs. Hire an employee fully experienced in every aspect of the job and you’ll quickly get boredom once they’ve learned your company’s ropes. There’s got to be room for growth or it’s not a fit. Savvy candidates screen the hiring company for the same elements to ensure fit from their perspectives. So… you’ve gone to all the trouble to make sure you’ve got the right people on the bus and in the right seats. Now what do you do? When companies use the process described above, their people naturally perform in a manner that syncs with intentions. And so, the need for management as workers traditionally know it disappears. People in the company still perform managerial functions such as planning and measurement, but overall you’ve effectively eradicated counterproductive behaviors like micromanagement. You’ve established a foundation for long-term, tightly knit relationships. The cost of turnover just plummeted. Remember, you purposely hired people for roles where they’d get an opportunity for growth. Expect them to make mistakes. Even better, challenge them (individually and as teams) to solve the sticky problems facing your company. Technology has changed the pace of economic transformation and the cycles will become even more rapid. Together, your brain trust can navigate challenges you can’t even yet predict. The problem with most incentive packages offered by companies has to do with misunderstanding motivation. We tend to use carrots. And sticks, of course, but they don’t belong in this model. True leaders typically do not use fear as a motivator. Studies show the extrinsic motivational techniques used to reward people for things they do as part of their natural behaviors decrease productivity. It’s also a mistake to establish expectations because, once set, they become entitlements. Not intentionally, but that’s just how the human brain works. Absolutely reward people. But do it in a way that recognizes their contributions in real time. A heartfelt thank you note does wonders. So does an unexpected bonus or a surprise day off with pay. Or afternoon of hookey. Just ensure that you share the wealth. Playing favorites will cause problems. Up Next: Designing the Employee User Experience (EUX™). We design products. We design processes. But we rarely design the employee experience. 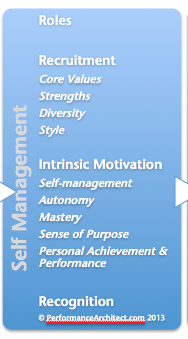 Corporate Self-awareness and Self-management provide two critical elements… but what’s next? *The assumption here is that the company will use a strengths-based leadership style and establish an appropriate infrastructure to support it. ← Can Companies Be Self-aware?